In order to maintain our oral hygiene, we need to take good care of our teeth. Similar to dogs, proper dental and oral care is essential to prevent not only bad odor but also oral diseases in dogs. Usually the first method that we all think of is to brush the dog’s teeth. However, brushing is not always the most optimal option for some dogs. In other cases, some dogs dislike brushing, which makes it impossible to brush their teeth. So what are other ways to clean dog’s teeth without brushing? If your dog is one of those, check out the following alternatives. If brushing is not your way, try dental spray. Consult a vet to know more about dental spray, then you can choose the most appropriate one for your dog. These sprays taste fine, and also give your dog fresher breaths. Additionally, they also have enzymes that can break down bacteria and plaque in your dog’s mouth, so bacteria and plaque can be cleaned off without brushing. A downside of this method is that it takes long time to be effective, as it comprises of ingredients that react only with natural saliva and water. Nevertheless, it is still a good and effective way to go when brushing is not your choice. Another option is to use dental gels. 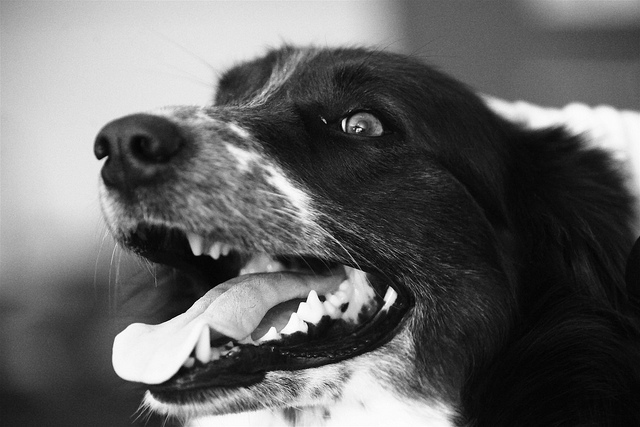 Gels can be applied on finger brushes and rubbed gently on your dog’s teeth. As these gels include safe and natural cleaning ingredients, they do great in giving your dog’s teeth a nice coat of protection against bacteria. If your dog dislikes brushes in general, you can try using your finger instead. In addition, these gels also come with attractive flavors that dogs love, and gels do last for a long time as well. Hence, this is totally a great alternative to brushing. Coconut oil is well-known for its ability to fight off bacteria naturally. For DIY toothpastes, coconut oil is also commonly used in various recipes. Therefore, using coconut oil alone can be another way to clean your dog’s teeth without brushing. The oil is not only completely natural and safe, but also very easy to apply onto dog’s teeth. Similar to gels, coconut oil can be applied by putting on your finger and rubbing onto the teeth surface. Another way is to just simply add coconut oil in food or snacks that your dog consumes. What if you don’t like these methods above? If you don’t think these methods would work on your dog, don’t worry. We have more ways coming up next for you. The chewing method also works great on dogs, and dogs do enjoy it much more than brushing. Dental treats can be easily found in many pet stores. The way it works is that as long as your dog chews, the chewing can help to eliminate plaque and tartar from his teeth. However, keep in mind that you’ll need to find the right size of treats for your dog, as your dog needs to chew long enough for the plaque and tartar to come off. 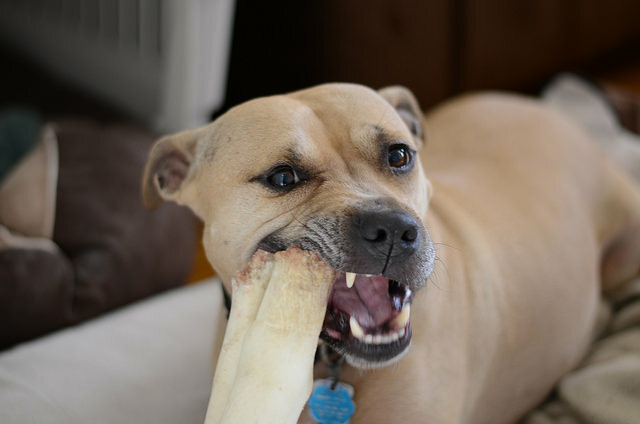 Similar to treats, chewing bones can help to remove tartar and clean the gum line. In addition to giving your dog a good time chewing, they are also flavorful that your dog may enjoy. Unlike bones, sticks usually get softer when wet, so they may be easier for your dog to chew especially if your dog is a bit older. Other than bones, sticks, and treats, natural hard foods is a good option too (and also healthier). You can give your dog some crunchy foods to chew such as carrots, which are not only chewy but also healthy for your dog. Another benefit of using fresh foods is that you can feed your dog these foods daily with no need to worry about the side effects. Fresh foods are natural and usually does no harm, whereas bones, sticks, and treats are more processed. Why do we need these alternatives? Oral health is just as important to dogs as it is to us. If their teeth are not regularly cleaned to remove food particles, they will soon become an ideal environment for bacteria to grow. Usually, brushing can help to eliminate those particles; however, brushing is not always comfortable for all dogs. And of course, we cannot just ignore their oral health in general. Thus, the alternatives above are very useful in order to maintain your dog’s oral hygiene and fresh breaths. While trying these alternatives, you can also try ways to make your dog enjoy brushing a little more. One way is to change the toothpaste. Instead of using unscented or minty-flavored ones, try using meaty-flavored toothpastes that appear to be more tasty to your dogs. Maybe you’ll find him enjoy these more. Again, maintaining oral hygiene for dogs is crucial, and there are plenty of ways you can try to clean your dog’s teeth without brushing, really. However, do not forget to visit a vet regularly to give your dog a general oral check and see if he has any oral disease. Keep in mind that not all methods work the same way, and some may not be suitable for your dog, so getting an advice from a professional is always recommended before you try any new method.